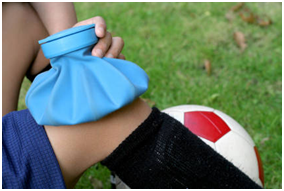 When an injury is sustained, the body immediately goes into overdrive in trying to repair the damaged tissues. At this point, the body’s soul focus is on survival, repairing the injured body part as quickly as possible. The problem with this is that scar tissue is simply laid down in a random/haphazard fashion with no consideration of what function will be left within the injured area following this poor healing. This scar tissue, coupled with the stagnation of accumulated swelling may leave the injured individual with significant reductions in range, strength and function which will limit their ability to function at full capacity as they attempt to return to full sporting participation. This is why appropriate early management of these injuries is vital. When should Physiotherapy management of sports injuries commence? Physiotherapy management of a sports injury is most effective if initiated within the first 48 hours post injury. What benefit does early initiation of Physiotherapy management offer? Early Physiotherapy management enables accurate acute assessment of the injury with early rehabilitation measures being put in place that are specific to the region and nature of the injury sustained. The prompt initiation of these measures may change what could have been a 6-8 week injury into a 4-5 week rehab with diminished scar tissue formation in the long term.